A Digital Object Identifier (DOI) is a way to keep track of content in a digital environment. Many publishers are assigning a DOI to each article in an issue. 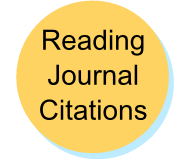 The DOI is unique and can be used by the reader to locate more citation information about the article. When a DOI is assigned, use it in place of other locating material (URL or database name). The ##-## represents the page number range of the article. The first example refers to print journals or journals from a database without a DOI assigned. The second format is for any journal article when a DOI is assigned. The third example is for journal articles available for free online, no DOI assigned. Author’s Last name, First Initial. Second Initial. (YEAR, Month Day). Title of article. Title of Journal, Volume(Issue), ##-##. Article from a print journal (no DOI) (Marshall & Clark, 2010). Marshall, M. & Clark, A. M. (2010). Is clarity essential to good teaching? Teaching Philosophy, 33(3), 271-289. Notice that periodical titles are capitalized like the standard title capitalization where all major words in the title are capitalized, Title of Periodical. DOIs now frequently are made to be resolved more easily by adding the prefix http://dx.doi.org/ When this prefix is used, you do not need the doi: before the http in your reference. See an example below. Article from a journal in a database with a DOI with the http prefix (Cheung, Kulasegaram, Woods, Moulton, Ringsted, & Brydges, 2017). (Whitlock, Eells, Cummings, & Purington, 2009). (Negi, Bender, Furman, Fowler, & Prickett, 2010). Not sure what each element of a citation means? Here is a step-by-step guide on understanding a citation, and creating your own! Any DOI can be copied and pasted into the DOI resolver to get more citation information than is available in a reference list. Try it out, copy a DOI on this page and paste it in the DOI resolver.